When a family chooses cremation, they may still want to have a viewing for their loved one. This opportunity is available with Crescent's full line of Cremation Caskets and Alternative Containers. By choosing one of these lines, the family can still experience a traditional viewing but also have the benefits of cremation. The Canton Alternative Container has white crepe interiors which makes it ideal for a family viewing. A pillow is included and the dimensions are 26” W x 80” L x 13.25” H. The weight is 23 lbs. and the weight cap is 300 lbs. Available with* or without handles. The Madison Alternative Container has a white crepe interior which makes it ideal for family viewing. The dimensions are: 26” W x 80” L x 13.25” H Weight: 23 lbs. Weight Capacity: 300 lbs. pink or blue interior with wooden handles and brass accents, and finally the Cloth-Covered Wood Casket with a white crepe interior. 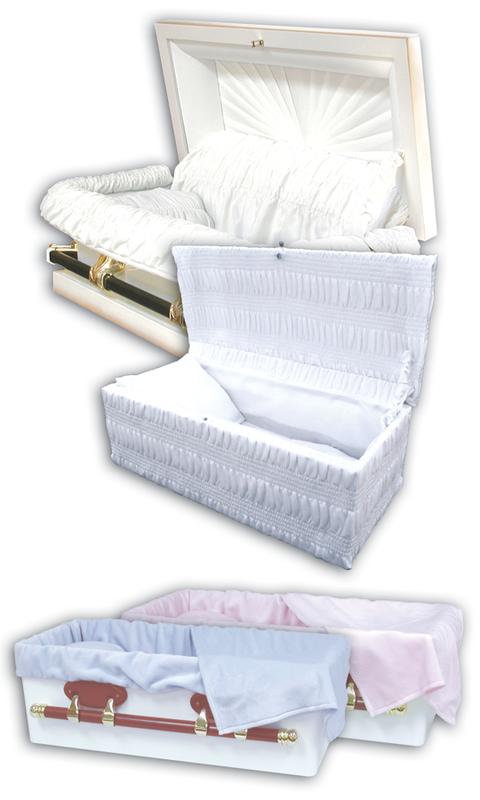 Th e Casket/Vault Combo is a high quality casket/vault combination at an unbelievable price. It features a solid wood handle with brass accents. Includes a White or Reversible blue or pink interior and butyl sealer for a permanent seal. Interior Dimensions: 9.25" W x 23.25" L x 10.5" D.